↑ F-35 First Flight. TeamJSF.com. Retrieved: 10 October 2007. ↑ "Report: F-35 Work Falls Behind Two More Years." CQ Politics, 23 July 2009. ↑ 6.0 6.1 "F-35 Capabilities." Lockheed Martin, 2009. Retrieved: 9 February 2009. ↑ "JSF program history." JSF.mil. ↑ "F-35 Test Flight Deemed a Success." ABC News, 15 December 2006. 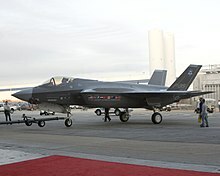 ↑ "F-35 Joint Strike Fighter (JSF) Lightning II." GlobalSecurity.org. ↑ "Hedging the Bet – JSF for the RAAF" (PDF). สืบค้นเมื่อ 2009-08-15. ↑ "Vertiflight". Journal of the American Helicopter Society. January 2004. ↑ Hayles, John. "Yakovlev Yak-41 'Freestyle'". Aeroflight, 28 March 2005. Retrieved: 3 July 2008. ↑ "Joint Strike Fighter (JSF). ", Jane's. Retrieved: 3 July 2008. ↑ Parker, Ian. "Reducing Risk on the Joint Strike Fighter." Avionics Magazine, Access Intelligence, LLC, 1 June 2007. Retrieved: 8 June 2007. ↑ "Researchers fine-tune F-35 pilot-aircraft speech system." US Air Force, 10 October 2007. ↑ "Technology News". Technologynewsdaily.com. สืบค้นเมื่อ 2009-08-15. ↑ "Joint Helmet Mounted Cueing System". Boeing.com. สืบค้นเมื่อ 2009-08-15. ↑ "VSI's Helmet Mounted Display System flies on Joint Strike Fighter." Rockwell Collins, 2007. Retrieved: 8 June 2008. ↑ "F-35 Capabilities". Lockheed Martin. ↑ APG-81 (F-35 Lightning II). Northrop Grumman Electronic Systems. Retrieved: 4 August 2007. ↑ Lockheed Martin Missiles and Fire Control: Joint Strike Fighter Electro-Optical Targeting System. Lockheed Martin. Retrieved: 11 April 2008. ↑ "Sniper Targeting Pod Attacks From Long Standoff Ranges". Aviationweek.com. สืบค้นเมื่อ 2009-08-15. ↑ "F-35 Air Combat Skills Analyzed". Military.com. สืบค้นเมื่อ 2009-08-15. ↑ Trimble, Stephen. "Rolls-Royce: F136 survival is key for major F-35 engine upgrade". Flight International, 11 June 2009. ↑ "Swivel nozzle VJ101D and VJ101E" (PDF). Vstol.org. 2009-06-20. สืบค้นเมื่อ 2009-08-15. ↑ "Going vertical. Developing a STOVL system" (PDF). สืบค้นเมื่อ 2009-08-15. ↑ F-35 gun system, General Dynamics Armament and Technical Products. ↑ 42.0 42.1 42.2 "F-35 Program Brief." USAF, 26 September 2006. ↑ "F-35 Lightning II News: ASRAAM Config Change For F-35." f-16.net, 4 March 2008. ↑ "Amraams". Aviationweek.com. 2007-11-08. สืบค้นเมื่อ 2009-08-15. ↑ Keijsper 2007, p. 239. ↑ Digger, Davis. "JSF Range & Airspace Requirements." Headquarters Air Combat Command, Defense Technical Information Center, 30 October 2007. Retrieved: 3 December 2008. ↑ "National Review". National Review. 2007-01-15. สืบค้นเมื่อ 2009-08-15. ↑ Fulghum, David A. "Lasers being developed for F-35 and AC-130." Aviation Week and Space Technology, (8 July 2002). Access date: 8 February 2006. ↑ Morris, Jefferson. "Keeping cool a big challenge for JSF laser, Lockheed Martin says." Aerospace Daily, 26 September 2002. Access date: 3 June 2007. ↑ Fulghum, David A. "Lasers, HPM weapons near operational status." Aviation Week and Space Technology, 22 July 2002. Access date: 8 February 2006. ↑ "F-35 Lightning II Program" (PDF). สืบค้นเมื่อ 2009-08-15. ↑ "F 35 Distributed Aperture System EO DAS". Youtube.com. สืบค้นเมื่อ 2009-08-15. ↑ 53.0 53.1 Trimble, Stephen. "US defence policy - and F-35 - under attack." Flight International, Reed Business Information, 15 October 2008. ↑ "Fighter criticism 'unfair' and 'misrepresented'." ABC News, 25 September 2008. Retrieved: 30 October 2008. ↑ 55.0 55.1 "Setting the Record Straight On F-35". Lockheed Martin, 19 September 2008. 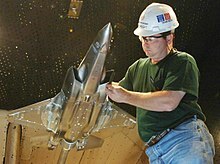 ↑ "Italy Wins JSF Final Assembly; U.K. Presses Maintenance, Support". Aviationnow.com. สืบค้นเมื่อ 2009-08-15. ↑ "Stealthy Jammer Considered for F-35". Aviationweek.com. 2009-06-15. สืบค้นเมื่อ 2009-08-15. ↑ "US Navy starts next-generation jammer bidding war". Flightglobal.com. สืบค้นเมื่อ 2009-08-15. ↑ "Mighty F-35 Lightning II Engine Roars to Life." Lockheed Martin, 20 September 2006. หน้านี้แก้ไขล่าสุดเมื่อวันที่ 25 มกราคม 2562 เวลา 18:41 น.